There is a growing trend towards ultra marathons with a ‘trend within a trend’ for off road ultras. The really long distance foot races are not by any manner of means a new thing – they go back for centuries. The classics, if I can call them that, were the Edinburgh to Glasgow 40+ miles and the Two Bridges 30+. 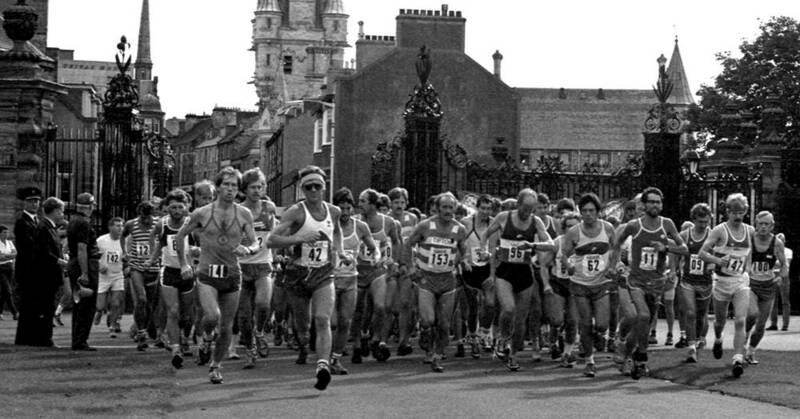 The picture above is of the 1983 Two Bridges starting in Dunfermline. However the Scottish tradition in these gruelling ultra long distance races goes well back – Walter Thom’s classic ‘Pedestrianism’ published by Pinetree Press with a foreword by Donald Macgregor, which was originally published in 1813 tells of a remarkable history. The first of the articles printed here is Adrian Stott’s top ten – his selection of his own ‘best ten’ distance races with most of the great personalities and athletes featured therein.